We’re proud to announce that The Claudettes are now being booked in North America by Blue Mountain Artists, along with the Kurland Agency, who books The Claudettes overseas! We’re just as excited to announce that they are now managed by Guy Eckstine and his Iconique Music Group. Guy has a fascinating history and quite a brilliant career as an A&R executive, artist manager, record producer, new media maven, Grammy board member, corporate consultant and musician. He has produced and Executive produced over 45 records, four of which have won Grammy Awards, including “The New Standard” by Herbie Hancock. Read more about him here. 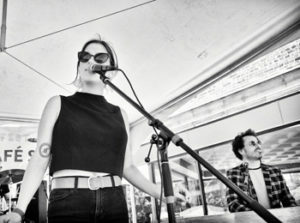 The Claudettes are adding tour dates all the time — see the latest list at https://theclaudettes.com/shows ! An Eden Brent Christmas with Bob Dowell Atop our Christmas wish list for years has been “new music from Eden Brent”. Atop Eden Brent’s to-do list for years has been “make a Christmas album”. What better way to kick off the holiday season than announcing An Eden Brent Christmas? This one also has a touching backstory. Soon after Eden met London trombonist/arranger Bob Dowell on the 2008 Blues Cruise, they began a relationship that included one particularly sweet tradition: they’d spend Christmases in Eden’s hometown of Greenville, Mississippi. The yuletide season had always held a special place in both their hearts, and the feeling deepened with each holiday visit. When Eden began to feel the urge to make her first Christmas album, it was clear that Bob (now her husband, who’d moved to be with her in Greenville) should write the charts. A graduate of the Royal Academy of Music, Bob had been immersed in blues, jazz and R&B for years, and arrangements were his forte. For the sessions, Bob tapped the deep pool of Memphis instrumentalists with whom he’s played and recorded. The musicians heard here have worked with B.B., Aretha, Booker T., Dr. John, the Bo-Keys and more. This project had been years in the making, but this became a “hit it and quit it” recording. One practice, one take: this is what largely went down, with a team of Memphis stalwarts, Bob’s inspired charts and Eden’s earthy vocals sounding more Etta than Ella. Whether you’re feeling a Dickensian winter bite or basking in balmy climes, this is a warm-hearted Christmas throwback you’ll spin every year about this time! Today, Billboard is exclusively premiering the new “Taco Night Material” music video by the Claudettes. Created by noted Brooklyn photographer/artist Kate Stone, the video was made using stop-motion animation and photographic cut-outs in a diorama-like set. It was entirely made by hand with no digital manipulation, and took about eight hours to animate every 30 seconds of footage. This Claudettes song is the confession of a woman who finds herself trapped in an oppressive marriage. Facing a future of agonizingly domestic “Taco-night Tuesdays,” she chooses murder over a life of never-ending wifely responsibilities. It’s a Women’s Empowerment anthem that doubles as a “killer” Halloween cut. 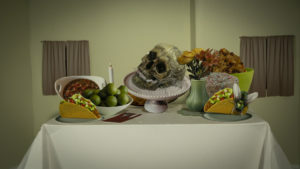 The imagery in the video references 16th-century vanitas paintings, but here the still lives are not still. It’s a fast-paced, surreal psychobilly romp with murder, intrigue, skeletons, bugs, rotting taco meat, singing appliances and, slimiest of all, fetid old gender roles. This tune was released on The Claudettes’ spring 2018 album DANCE SCANDAL AT THE GYMNASIUM! which you can find right here along with the band’s three additional releases on Yellow Dog Records!